George Sharvashidze was born on 7 November 1980, in Kutaisi. In 2002 - graduated from the Faculty of International Law and International Relations of the Tbilisi Ivane Javakhishvili State University and was granted Bachelor of International Relations Degree. From 2005 to 2006 - completed the International Relations and National Security Course provided by the Georgian Foundation for Strategic and International Studies, through the support of the U.S. Embassy to Georgia and the RAND Corporation. In 2009 - proceeded with his studies in France (ICN Business School, Nancy) and later in Italy (Universita Cattolica del Sacro Cuore, Milan) and earned Master of International Management Double Degree. From 2010 to 2011 - studied at the East China University of Science and Technology in Shanghai and was accorded Master of Business Administration Degree. From 1996 to 1998 - worked as chief editor of the newspaper “Isrimi” of the St Nino Gymnasium in Kutaisi. From June to November 2002 - worked as a coordinator of the Foreign Relations Centre of the President’s State Representative to Imereti. From 2004 to 2005 - served as a foreign relations manager at the Democratic Centre. 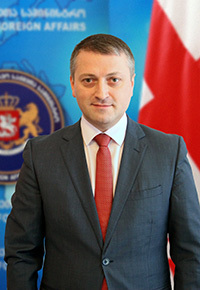 From 2005 to 2006 - worked as a chief inspector of the international relations division of the Administrative Department of the Ministry of Internal Affairs of Georgia. From 2006 to 2016 - worked at the Sarajishvili Joint Stock Company, at different positions. From 2016 to 2017 - worked as the Deputy Executive Director/Operations Director of the Sarajishvili Joint Stock Company.